CAST your mind forward eight-and-a-half months. A warm afternoon on October 28 descends into a cool Saturday evening. Polling booths across the state have just closed and ballot boxes tumble open to signal the end of one of Queensland's grubbiest election campaigns. The trend is early and clear: No party will have a majority as Labor nets just 32 of the newly expanded parliament's 93 seats. The LNP takes 42 seats and a smattering of independents is returned. 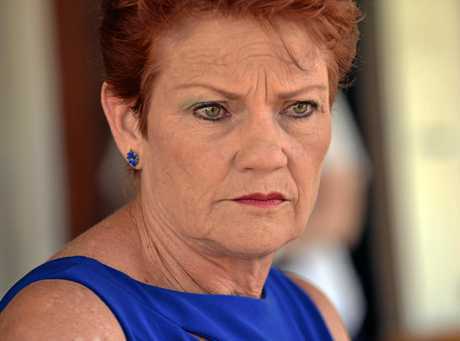 In shock news, One Nation won 15 districts - almost all taken from Labor in central and northern Queensland - because the LNP (in a fit of pique over its 2015 defeat) preferenced One Nation ahead of Labor. In early November, LNP Leader Tim Nicholls takes the oath as Premier, but One Nation says offering support on the floor of parliament on confidence and supply is not enough. One Nation demands a formal coalition arrangement and receives five spots: Police, Education, Environment, Treasury and Attorney-General. A One Nation MP is Deputy Premier and, in Nicholls's absence, acting Premier. The state holds its breath. Let's take a satirical look at what happens next. ONE Nation wastes no time in flexing its ministerial muscle over Nicholls. Consistent with its marriage policy, One Nation has negotiated a generous prenup agreement should the two divorce politically. If so, the LNP gets parliament house and One Nation gets the comfy chairs and nice water jugs. In striking a blow against the dreaded political correctness that holds Queensland back in recent NAPLAN results and Winter Olympic medal tallies, the Education Minister decrees it compulsory to sing Christmas carols in all schools in December, and in all months containing a vowel. Buoyed by his success, the Minister in January announces "intelligent design" will be taught in schools as an "alternative fact" science. It will be taught that God created the world in six days, and - consistent with One Nation's industrial relations policy - worked on Saturday without penalty rates. In social studies, it will also be taught that single parents are an un-Australian drain on welfare. After another February of record-breaking heat, the Environment Minister declares anthropogenic climate change a fraud designed by Marxist daylight-saving lobbyists hellbent on destroying the state's vibrant night-life and fading our cows. After all, he says, he still wears a cardigan in July. Stung by media criticism, cabinet agrees in March that voters must have a say on all policy through the Citizen Referred Application Process, or C.R.A.P. One Nation happily announces that, from April, all government policy will be CRAP policy. Weighed down by soaring regional joblessness and reminded daily of its promise of zero unemployment, One Nation announces the launch of hundreds of state-owned cottage firms. Dozens of printing shops now dot provincial Queensland where their only business is running off millions of One Nation how-to-vote cards, and wallet-sized portraits of Donald Trump and Geert Wilders. The Government also opens scores of butcher's shops where no halal or kosher food is sold, instead selling sausages made of kangaroo, koala and shredded application forms from dumped One Nation candidates. In May, all state fees and charges are abolished and replaced with a cascading 2 per cent "easy tax". When Treasury warns the state will be bankrupt within a year, chook raffles and bric-a-brac stalls are held at community cabinet meetings. No one attends. In June, Trump and Vladimir Putin accept invitations to visit the state where they're lauded as "strong, admirable" leaders. Terrorism, tariffs, Twitter and Ivanka Trump's clothing line headline the discussions. The next month sees Canada protest Queensland's close relationship with Trump. In response, the state declares a trade war with Canada, losing $100 million in beef trade while Canada loses $450 on maple syrup exports. A furious pancake lobby marches on Parliament House. In September - 12 months since Annastacia Palaszczuk called the election - the Electoral Commission reports an emergency redistribution must be held after the state's population plummets. With 4.7 million people escaping One Nation and flocking to other states, just 112 people remain in Queensland. The usual joke imploring the last person leaving the state to turn out the lights is resisted. It doesn't matter how long the lights burn because global warming is fake news. Only eight-and-a-half months to go.